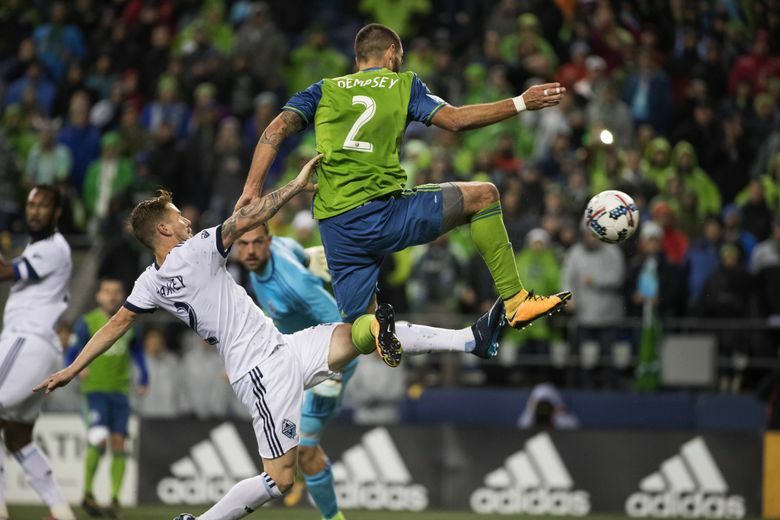 Sounders forward Clint Dempsey on Wednesday was named MLS Comeback Player of the Year after scoring a team-high 12 goals a season after being diagnosed with an irregular heartbeat condition that could have ended his career. Clint Dempsey says he has yet to write the final chapter on his storybook comeback season. After being named MLS Comeback Player of the Year, the Sounders forward on Wednesday talked about the importance of big games and even bigger moments, something he missed during last year’s MLS Cup championship run when sidelined by an irregular heartbeat. Now, with sources confirming he has agreed to a one-year contract extension for 2018, Dempsey is focused on next week’s Western Conference Finals opener at Houston and helping the Sounders return to the title game. “I really don’t look at individual awards that much, to be honest with you,” Dempsey, 34, said after edging Federico Higuain of Columbus and Houston striker Erick Torres to capture the award. “It’s more just enjoying the game, where you’re at. Enjoying your play and making the most of your career. That’s the ups and the downs and the roller coaster of everybody’s career that they experience. Few goals scored by Dempsey in a Sounders uniform since 2013 were bigger than the two he potted against the Vancouver Whitecaps last week in a clinching conference semifinal victory. Dempsey scored a team-high 12 goals in the regular season despite admitting he didn’t feel quite himself until May or June. That late spring period coincided with his strong performances for the U.S. men’s national team and a subsequent club-record 13-game unbeaten streak by the Sounders in which Dempsey played a key role. The Sounders, by policy, don’t comment on player contracts until a season ends. But an ESPN report soon after Dempsey’s award announcement first revealed that he had agreed to an extension for the 2018 season. Schmetzer hinted about Dempsey’s return when discussing his award. Sources later confirmed that the ESPN report was accurate. Dempsey is focused on the first leg of the two-match conference final on the road against a Dynamo team that beat his Sounders 2-1 in Houston in the season opener. Dempsey scored his team’s only goal in that game. But Dempsey figures the Sounders sticking to what they do best likely will produce a good result. And they have arguably their best player back, hoping to help them provide the big moments in which he thrives.